Frequent visitors know that the LightBoost strobe backlight can eliminate motion blur on computer monitors. You may have heard of the LightBoost percentage adjustment, adjustable either via on-screen menus and/or via ToastyX Strobelight. You may be asking: What is this setting? What is the LightBoost setting for? The LightBoost setting adjusts the length of the strobe flash of the LightBoost strobe backlight. Shorter backlight flashes per refresh, results in lower persistence, which leads to less display motion blur when your eyes are tracking moving objects. Higher LightBoost % settings result in a brighter picture and slightly more motion blur. Lower LightBoost % settings result in a dimmer picture and slightly less motion blur. A very slight decrease in ghosting/crosstalk also occurs at lower LightBoost % settings. View www.testufo.com/photo while adjusting LightBoost % setting up/down. 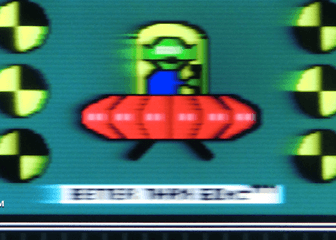 In TFTCentral: Motion Blur Reduction Backlights, which I contributed in creating, they also confirmed LightBoost strobe lengths using an oscilloscope. These UFO objects below were moving horizontally at 960 pixels per second, at a frame rate matching refresh rate, on an ASUS VG278H LCD. These close-up pictures were taken using a pursuit camera at 1/30sec exposure on TestUFO: Ghosting, exposing multiple refreshes into same photo. LightBoost = 100%: Backlight strobe flash of about 2.4 milliseconds per refresh. 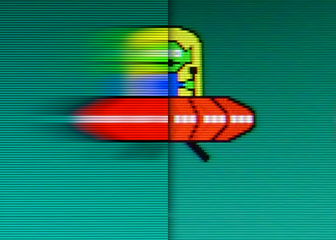 This results in slightly over ~2 pixels of motion blur during 960 pixels/sec motion. The alien eyes are blurred and the white dots in the UFO base is noticeably blurred. LightBoost = 50%: Backlight strobe flash of about 1.9 milliseconds per refresh. This results in slightly less than ~2 pixels of motion blur during 960 pixels/sec motion. The alien eyes are still blurred, but vertical edges are now slightly sharper. LightBoost = 10%: Backlight strobe flash of about 1.4 milliseconds per refresh. This results in approximately ~1 pixel of motion blur during 960 pixels/sec motion. The alien eyes are now crisp, and vertical edges are now crisp. Is LightBoost 10% Worth It? Simply turning on LightBoost makes the biggest difference, compared to the differences between LightBoost 10%, 50% and 100%. 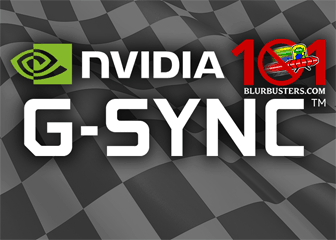 The motion blur improvements of going to LightBoost=10% only benefits the fastest motion, such as FPS gaming. If you thought LightBoost was too bright for your eyes anyway, lowering the LightBoost % setting is an excellent way to reduce brightness while gaining further motion clarity benefits. When tracking eyes on moving objects that move at at 960 pixels/second, your eyes are tracking moving objects along the screen plane at very close to 1 pixel per 1 millisecond. As a result, static frames are blurred across your retinas (animation of eye tracking motion blur). This is consistent with oscilloscope measurements, as well as the pursuit camera photographs. 60Hz non-strobed = 1/60sec = 16.7ms = about 16 pixels of motion blurring. 120Hz non-strobed = 1/120sec = 8.3ms = about 8 pixels of motion blurring. LightBoost 100% = 2.4ms strobe flash = above ~2 pixels motion blurring. LightBoost 50% = 1.9ms strobe flash = slightly under ~2 pixels motion blurring. LightBoost 10% = 1.4ms strobe flash = about ~1 pixel of motion blurring. For display users: It is a user preference in adjusting motion clarity vs brightness. For display manufacturers: We hope that upcoming strobe-backlight monitors (e.g. EIZO, BENQ, G-SYNC) allow a strobe-length adjustment via menus, as a method of adjusting brightness, in a brightness-versus-clarity tradeoff. It is very a simple engineering feature to permit the strobe flash length in a strobe backlight monitor to be adjustable. What About ULMB — Ultra Low Motion Blur? 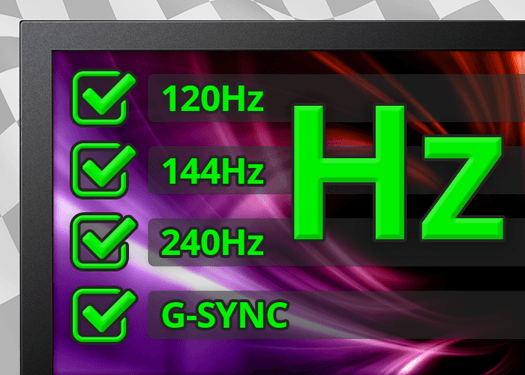 Newer G-SYNC monitors with ULMB, have an equivalent setting called “Pulse Width“. This does exactly the same behaviour as LIghtBoost Level adjustments. Smaller Pulse Width settings is darker and clearer, while bigger Pulse Width settings are brighter and sligthly blurrier. If you’re purchasing a new monitor today, consider getting a monitor with ULMB, as it is much easier to enable ULMB than LightBoost. Pursuit camera are used by display manufacturers for testing (e.g. MotionMaster, and other MPRT pursuit cameras). This is simply a camera that follows on-screen motion. These expensive cameras are extremely accurate at measuring motion blur and other artifacts, since they simulate the eye tracking motion of moving eyes. 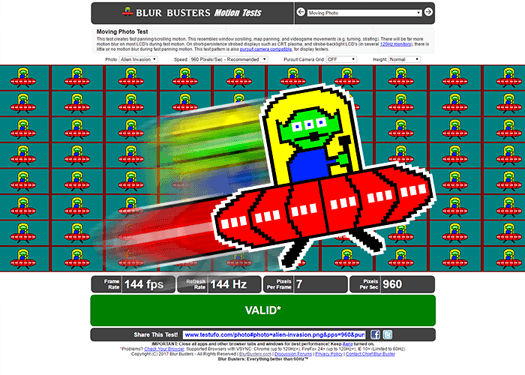 Blur Busters has developed an inexpensive pursuit camera method which operates in conjunction with the Blur Busters Motion Test (www.testufo.com), and also makes possible accurate photography of common LCD motion blur artifacts. The Ghosting Motion Test was used to take the pictures on this page, with the ASUS VG278H monitor adjusted to lower contrast (65%). 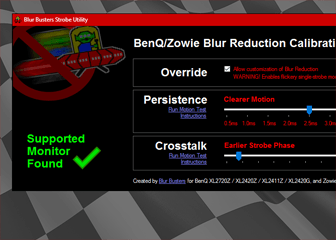 Blur Busters is the world’s first site to utilize a pursuit camera for the accurate capture of motion artifacts, in WYSIWYG format, as seen by the human eye. A Panasonic Lumix DMC-ZS3 was used to take these photos with the pursuit camera HOWTO, before Blur Busters obtained the now-preferred Casio EX-ZR200. Camera ISO settings were adjusted to attempt to maintain photo brightness and exposure level to 1/30sec at reasonable photo brightness. This is since different LightBoost % settings create different brightnesses when seen by eyes. LightBoost=10% is much darker than LightBoost=100%. The brightness of the photos were equalized to allow for easier motion blur comparison. Only a final quadrilateral correction was done to de-skew the photos, leaving the blurring unmodified. For the known strobe lengths, the comparison graph was created from motion tests & oscilloscope measurements, including PixPerAn and Blur Busters Motion Tests, and cross-checked with TFTCentral oscilloscope tests. Accuracy +/- 0.1ms, assumes TN panel technology with optimized RTC, motion tests done with VSYNC ON with frame rate matching refresh rate. We use 960 pixels/sec since that value is the closest value to 1000 pixels/sec that is divisible by common computer refresh rates (60Hz, 120Hz) as close as possible to matching 1 pixel = 1 millisecond. This also represents half a screen width per second on a 1920×1080 display. This is representative of common motion speeds found in computers/games, including strafing, turning, scrolling, panning, and other similar fast motion. LightBoost 10%, LightBoost 50%, LightBoost 100%. 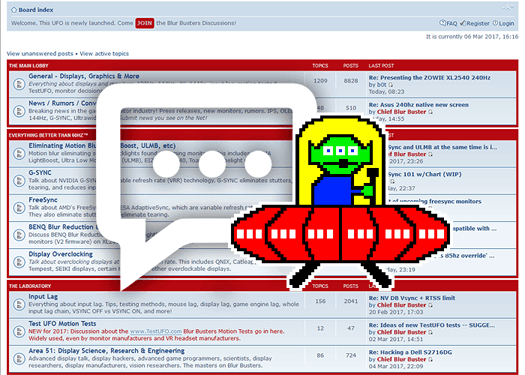 New information: An informal poll on Blur Busters Forums, got replies from a significant minority of the forum membership, showing a not-insignificant number prefer the benefits of LightBoost 10% for motion clarity. Display makers designing strobe backlights, should allow persistence (strobe flash length) to be adjustable.